So I did it! After three days of having the phone number minimised at the bottom of the computer screen I called the Cochlear Implant Clinic to find out the status of my referral. I rang through the National Relay Service and spent the mandatory five minutes navigating through the pre-recorded answering machine. Eventually I ascertained that I needed to dial zero, which is for OTHER. Unsurprisingly, given the time lapse between now and the actual referrals, they had no record whatsoever of my two referrals. So now I gotta go through the whole process of getting a referral again. My attempt at humour led nowhere. Rather confused they tried to indicate that I must have been seen at the hospital. I told them that I was seen at the surgery. I even clearly described to them their hearing test booth, its colour and its size. But still they insisted that I had never been there and that there was no record of me. I pointed out that they are supposed to keep records for seven years to which they said, “…Best see your GP for another referral.” They then promptly hung up on me. Footnote to self – Humour and legal references will get me nowhere. I really am not looking forward to having to go through this process again. But one must do what one must do. The last time I visited the good Doctor I asked him to look at cleaning out my middle ear. I have had this done before and it usually provides me with a measure of hearing that is useable with a hearing aid. The good Doctor did not even acknowledge my request, which is sadly a common occurrence with Doctors in my experience. He instead sent me to his in-house audiologist for a hearing test. 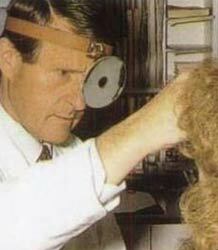 The audiologist wasn’t a particularly good listener either. I tried to explain to her what the test was likely to indicate. Like the good Doctor she did not even acknowledge the information that I was providing her. In her defence she probably gets any matter of opinions from her clients and has probably become a bit immune to the needless natter. I told the audiologist that what she would get was basically a flat line. She just ushered me into the booth. So I sat there in the booth. The audiologist came and set me up. Of course she had to explain to me that I needed to press the button if I heard anything. It was only my one thousandth hearing test but she wasn’t to know that was she? I knew when she had cranked it up real loud because I could feel the vibration in the headset. For me to indicate that I had heard when in fact I had felt the vibration would have been misleading. So I sat there with button untouched. The poor Audiologist was somewhat bemused. She opened the booth door to check on me. She must have thought I had died or something, so unresponsive was I. She left to twiddle the knob some more and came back to look at me. I was still unmoved. As her head poked round the door again I gave her a little smile. It may have just been my imagination but her eyes seemed as wide as an owls, such was her shock. After ten minutes or so she brought the test to an end. She looked almost as white as a ghost. I reassured her that it was ok. I told her there was nothing to worry about and that the result was not unexpected. She fiddled around a bit and said the Doctor would explain the results to me. She could not meet my eyes. It was a huge effort on my part not to burst out laughing at her reaction. So I went back to the Doctor who looked at the results and then back to me. I said, “Pretty neat huh?” He gave me a wry smile and said, “… that’s one way of looking at it.” I tried one more time to get him to consider having a look inside to see if a clean out might help but he was having nothing of it. He made the referral to the Eye and Ear Hospital. He said that the specialists there might be able to recommend some, “Aided hearing strategies” to help me. “You mean a Cochlear Implant?” I asked. He acknowledged that as one such solution. But anyway that was a few years ago now. It is history that I have decided to get serious about assessment for a cochlear implant. Alas I have left it a wee bit late and have to go back to square one and get another referral. So square one it is. Let’s see where it goes from here. Stay tuned for the next instalment.